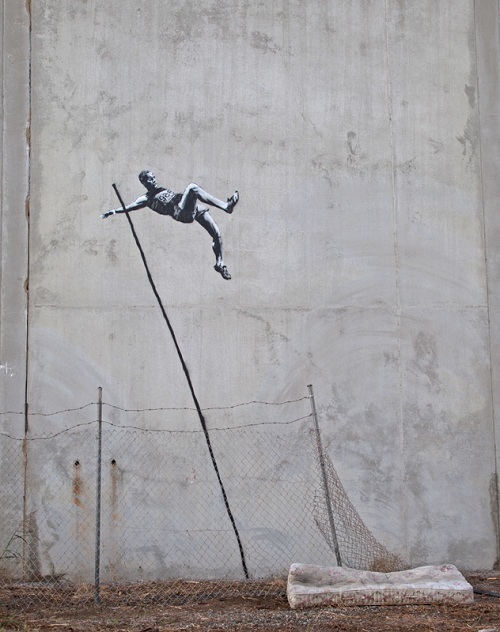 Graffiti artist Banksy produces two Olympic-themed works that challenge the glorified image of the world’s premier sporting event. Bansky, the renowned graffiti artist who was nominated for an Academy Award in 2010 for his film Exit Through the Gift Shop, has left his artistic mark throughout the world. His work is often political and sheds light on social issues, including injustice and corruption. Millions are awed by his poignant satirical expressions, which often bring him into conflict with the authorities. The London Olympics is the target of his latest work, which he revealed on his website on Monday, although their physical location is unknown. Hackney Welcomes the Olympics presents an athlete throwing a javelin that looks like a missile, and Going for Mould shows a man pole vaulting over a fence onto a worn mattress. Both stencils could prove troublesome to the International Olympic Committee and the London authorities, which are trying to sustain the glorified image of the world’s premier sports competition. According to some artists, even prior to the Olympics opening, the London authorities began painting over graffiti in preparation for the games, an accusation the authorities deny. Several street artists were reportedly arrested, including Darren Cullen, “on suspicion of incitement to commit criminal damage,” the BBC reported. 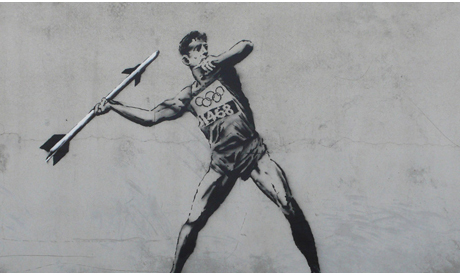 We are yet to discover if Bansky’s new work will be obliterated by the authorities in their efforts to maintain the glorified image of the Olympics.